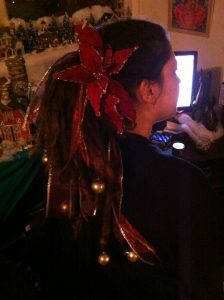 DIY and Dreadlocks? Why Not! 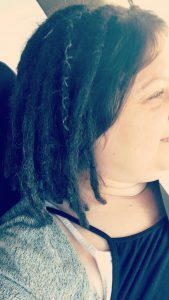 Karen gave us some tips on a very popular embellishment of wrapping a dreadlock – although invented for dreadlocks, this can just as easily applied to regular hair sections that are not dreadlocked. Our VP, Daniela chose to only wrap one section of her hair in a subtle grey with some extra Icelandic wool Karen had, but you could increase the cool factor exponentially by using multi-coloured fabric scraps or threads and adding embellishments like sewing on buttons or other fun charms and notions. The more sections you embellish with more colours, the funkier the hair looks. The best thing about this technique is you can really express your own sense of style with its versatility. You can wrap either your entire hair section or just a little bit at the root and then tie or sew on an accessory if you wish. It can all be easily removed so it requires no commitment. Jewellery, buttons, charms and beads make great hair embellishments! Earrings, in particular, are great and Daniela did once show up to an office Holiday Party with Christmas ornaments dangling from her dreadlocks! If you’re going to use long thin strips of material (i.e. T-shirts or scarves), use the two ends to crisscross around the dreadlock which allows the dread (or hair section) to breathe and dry properly. Hair that is wrapped fully takes longer to dry and retains moisture which can cause a damp unpleasant smell. It’s O.K. to fully wrap your dreads/hair sections but be mindful of the dampness. 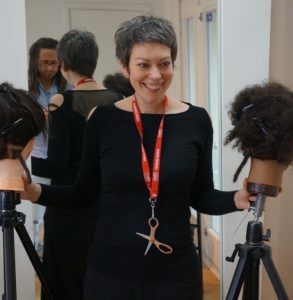 When you’re ready to remove the accessories that have been tied in or wrapped, use a stitch ripper instead of scissors – for better control and less chance of cutting your hair by accident! Use organic breathable fibres over textiles that do not breath in order to ensure proper drying to prevent mould-ew. If you have loads of string & yarn scrap, bind them together prior to wrapping. The multi colours & textures add interest.